Brent Burns was the Minnesota Wild's First round choice in the 2003 NHL Entry Draft. Good day. Actually, there have been a lot of great days for Minnesota defenseman Brent Burns this season. As Burns reached for a shirt from his locker after a game in St. Louis last month, teammate Pavol Demitra pointed to a tattoo adorning the back of the 6-foot-5, 219-pound defenseman. It said, "I now have nothing but good days and great days." It is a quote that honors the fighting spirit of Lance Armstrong, who overcame cancer to win the Tour de France seven times. Demitra then added, "This was a really great day, Burnzie." Actually, it was a great two days for Burns, who had scored the game-winning goal for the second straight day -- giving the Wild overtime and shootout victories against the New York Islanders and Blues, respectively. Burns' goal against the Isles came when he jumped into the play and scored his third career overtime winner. He put an exclamation point on the victory against the Blues a day later with a move most defensemen wouldn't even attempt. As he charged down the ice, he stutter-stepped as he approached the net and drew the puck back. St. Louis goalie Manny Legace bit on the move, leaving Burns an empty net in which to lift the puck. After the overtime game-winner, Wild coach Jacques Lemaire talked about Burns' potential to skate and recover defensively, his good touch around the net and the fact that Burns' skills give him the right to take chances that lesser defensemen don't get. The shootout attempt was something completely different. It came in the sixth round, and only after assistant coach Mario Tremblay lobbied hard for Lemaire to choose Burns for his first career shootout opportunity. Burns admitted he had no clue what he was going to do, that his creativity took over at that point. "I remember I saw my buddy Ryan Getzlaf make that move a couple of times at the World Junior tournament, so I thought I'd give it a try," Burns said. "Hey, he's the one who's got the hands and all the moves, not me. "Seriously, I had all I could do to not trip over my own feet." If you haven't heard much about the 23-year-old forward-turned-defenseman, stick around. The 20th pick overall by the Wild in the 2003 NHL Entry Draft (one pick behind Getzlaf) quickly is rewriting the Wild record book for all things offensive this season. Burns scored his 14th goal and set up Branko Radivojevic for another to start Minnesota's 3-1 victory March 17 against Colorado. Burns now has 41 points this season. The previous Wild records for defensemen were set by Lubomir Sekeras -- 11 goals, 23 assists and 34 points -- in the 2000-01 season. Burns may have been a surprise to some going as high as No. 20 in the 2003 NHL Entry Draft, but clearly he was born to be a hockey player, literally and physically. Gaby, his mom, went into labor with him while she was at a rink watching her husband, Rob, play in a recreational league game in March 1985. Rob Burns was a metal factory worker by trade, but after the couple had three kids (Brent, younger brother named Brad and sister Kori), there became a need to supplement the family income. The extra job turned out to be a paper route that Brent and his father had delivering copies of the Toronto Star ... and they did it early each morning on roller blades. Burns' background shows he's full of surprises -- especially to the Wild. 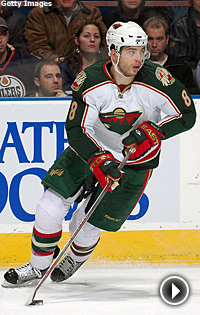 "There was a lot of late development in Burns' last year in juniors," said Doug Risebrough, the Minnesota GM. "We knew that he'd played a little bit of defense, but we had no intentions of drafting him to play defense. We saw the size and speed and shot and figured he could be a power forward once he developed. "Clearly, I wouldn't say this is the classic way to develop a young player. You wouldn't think a lot of guys once they got a taste of scoring would want to go back. But Brent just wanted to play. He didn't care where." Maybe it was Lemaire's background in Montreal, where big defensemen used their size and speed to work the transition game when the Minnesota coach was winning 10 Stanley Cups as a player. Whatever the reason, Lemaire had a hunch Burns -- a defenseman in juniors before switching to right wing midway through 2003 -- might thrive on the blue line. But, it wasn't until the final week of Burns' rookie season that the coach moved him back to the blue line to fill in for injured defenseman Filip Kuba. 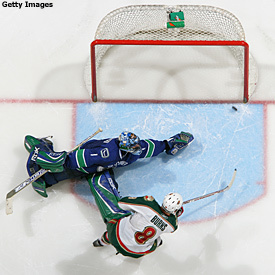 In 2005-06, Burns played both positions, switching back to defense for good late that season. "To Jacques' credit, he thought Brent would develop quicker with more ice time," Risebrough added. "With that big body and quick feet, he is definitely used to getting up the ice as a winger." Burns' life isn't all about hockey, though. He has five tattoos. He owns three guitars, two expensive racing bikes to quench his love for cycling and interest in the life of Lance Armstrong. Plus, he's got his own little Noah's Ark -- two huskies, two cats, two large, fast-talking birds and a large and unique sampling of fish, a group that includes a shark. His greatest passion, though, is reading. "I've loved to read since I was a kid," he said. "I remember when I was growing up we had a loft in the garage that had a fort up there. But I always seemed to be attracted to several huge boxes my dad had up there filled with books -- most of them war books. I'd sit there all day and read them." Burns has scored five points in his last five games. Burns first got interested in war stories by listening to Patrick Burns, his grandfather, who was an artilleryman in World War II. Like with everything else in Brent's life, the list of books in his library cover an assortment of subjects. The military tomes start back in the Roman Empire and include topics on the Civil War, World War I and World War II. He even has a book about the Viet Cong. Plus, he said he has the complete Harry Potter series, nearly every word that has been written by or about Lance Armstrong and most of John Grisham's legal thrillers. Moving Burns back to defense wasn't always without tests for Lemaire. I'll never forget the coach throwing his arms in the air in confusion over a bad turnover Burns made in a game in St. Louis a little more than a year ago. Reporters wondered when the experiment might end, to which Lemaire replied, "Hey, Rome wasn't built in a day." After getting a few laughs at Burns' expense, I remember asking Lemaire about the trial and error of such an experiment. He smiled and said, "All they ask racehorses to do is run, right? Well, not quite. Brent Burns is at a part of the development stage for a young defenseman. What I like most about Burnsie is that he just has fun playing hockey. And I really love his attitude to learn on the job." What about playing on defense appeals to Burns? "I'm more comfortable on D," he said. "I feel like more is expected of me on the blue line. You get the puck more and get into the game a little more. On defense, there's a lot of communication with whoever you're playing with. You really have to be sharp out there, because if you make a mistake everyone in the rink knows it. So it makes you focus more. You can't be lackadaisical. It makes you think. I like to be counted on. "Besides, I proved I couldn't score a lot of goals when I played up front." Whether he's playing forward or defense, one thing we know for sure is Burns seems to have nothing but good days and great days.